This is a detailed journal article from 1974, now available on the web. 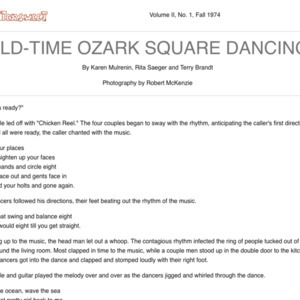 It includes a general discussion of Ozark dancing, interviews, photographs, diagrams, and descriptions of two dozen figures and dances, including lots of patter. "Square dancing and round dancing were the two kinds of dancing in the rural areas of the Ozarks in earlier days. ... The old-time square dancing of the Ozarks brought here by early settlers from the mountains of eastern Tennessee and Kentucky followed the basic folk pattern. The old way was to have each of the four couples in turn lead the others in the same dance. Couple number one would go as directed by the caller to other couples in turn to "Take a Little Peek" or lead the others in the "Wild Goose Chase." Then couple number two would lead in the same call, going to the other three couples in turn. Depending on the dance, sometimes couples would stand for periods of time doing nothing, waiting their turn while the other couples were dancing. The jig step which is characteristic of some dancing in this area, probably developed as a way of participating or filling the time so that everyone was dancing all the time." There are interviews with Charles Holloway, a square dancer, and Charlie McMicken, an old-time caller (presumably from the Springfield, Missouri area, though this is never made explicit). Holloway is a member of the Ridgerunners, an exhibition square dance group that incorporates “jigging” in its performances. McMicken, about 70 at the time of the interview, started calling at age 20 (c. 1924) and learned from callers who learned the calls 50 years earlier (c. 1874). This matches the chronology implied by the author’s note in Boyd and Dunlavy’s seminal book Old Square Dances of America (first edition 1925). Readers interested in more detail might want to track down a copy of a 1974 recording with McMicken calling, part of a Music of the Ozarks collection. 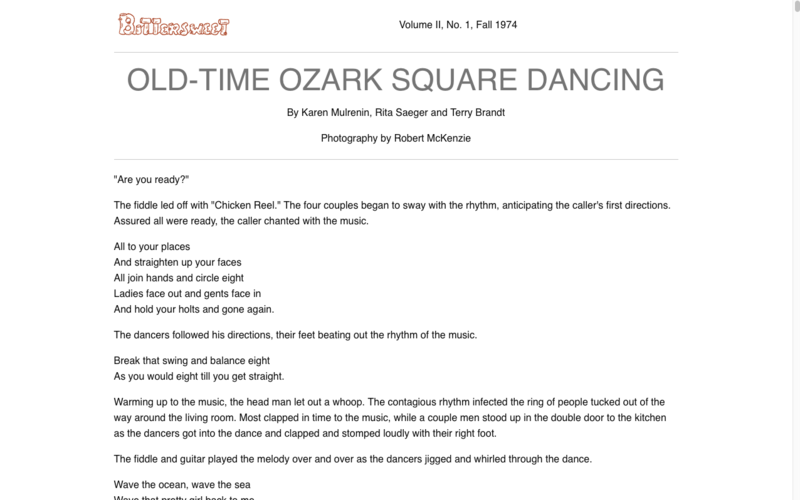 Karen Mulrenin, Rita Saeger and Terry Brandt, “Old-Time Ozark Square Dancing,” Square Dance History Project, accessed April 25, 2019, http://squaredancehistory.org/items/show/500.